If It’s School Health, Nurse Kristin Can Handle It. The mission of The Lexington School is to provide an education of the highest quality to students in preschool through middle school. In a structured, nurturing environment, The Lexington School seeks to instill integrity, a life-long enthusiasm for learning, and a strong work ethic. “Mr. Smith, this is Nurse Kristin, and it’s NOT an emergency.” This is the informative call from the School Nurse at The Lexington School. Maybe it’s a sore throat, maybe Johnny threw up his lunch; whatever it is, if it’s related to SCHOOL HEALTH, Nurse Kristin can handle it. Need a band-aid? Go see Nurse Kristin. Fall on the playground? Have a stomach ache? Have a loose tooth, need your insulin dose? Go see Nurse Kristin. She has it and does it all. And believe it or not, she’s a rarity: she’s the ONLY full-time school nurse in Fayette County. It is impossible to imagine The Lexington School without Nurse Kristin Beers. She is a household name. For 16 years, she’s made a “boo-boo” feel special, a lost tooth a golden pearl one hangs around one’s neck, and a fever something really significant without being too scary. She is good at her job. She connects with her patients, kids ages two through 14 years of age, and she connects with her colleagues–faculty and staff at The Lexington School. She teaches CPR, how to manage “blood-born pathogens,” and how to administer an epipen (just in case). 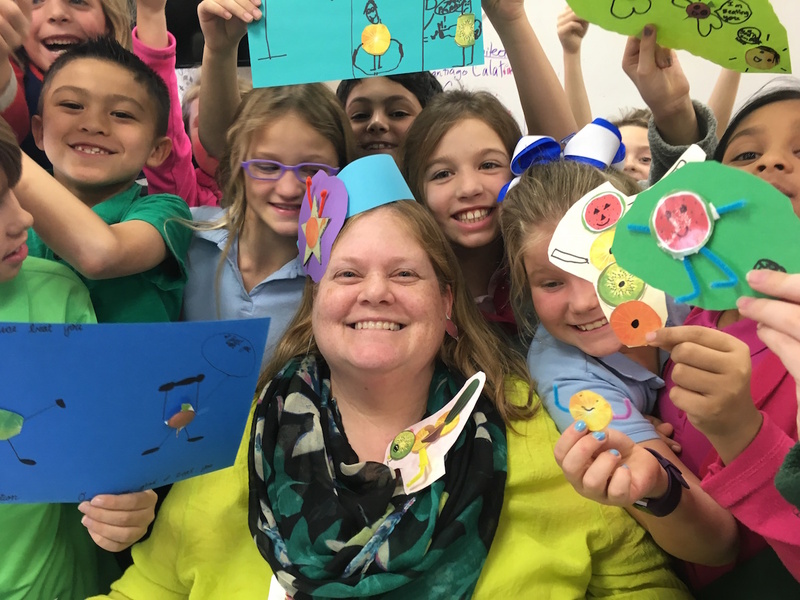 She teaches teachers and kids through the humor and love that comes natural to her. Going to the nurse’s office is a TREAT. Nurse Kristin trains faculty and ices elbows, and much, much more. She partners with 5th grade teachers on student health and body awareness and the librarians on an alcohol and drug prevention series. And while Lexington School students study nutrition all year long through the Dining Hall Program with Chef Ryan, National Nutrition Month took Nurse Kristin into an integrated deep dive with teachers and students of all levels. During the month of March, Nurse Kristin worked with every grade level on putting their “best fork forward” in choosing the right balance of foods throughout their day. In third grade art classes, Kristin facilitated a cookbook project where students created and built healthy recipes, drew artistic renderings, and soon they will publish their books on “Blurb” for their families to download. Nurse Kristin is passionate about student health. As a nursing leader in Kentucky and member of the National Association of School Nurses, Kristin practices the “whole school, whole community, whole child” model of health education. As a full-time member of The Lexington School’s faculty, she teaches, treats, and inspires. She makes a WHOLE lot of difference. What a great article Kristin! Your mom would be so proud of you!! Felicidades a mi amiga Kristin, I am proud to be part of her extended family. Nurse Kristin is amazing! Knowing I don’t have to worry about my daughter who has Type 1 Diabetes and Celiac disease while she is at school is such a relief! Nurse Kristin is invaluable!